"San Domingo", "Haiti (island)", and "Hayti (island)" redirect here. For other uses, see San Domingo (disambiguation), Haiti (disambiguation), and Hayti (disambiguation). "Isla Española" redirects here. For the island in the Galápagos archipelago, see Española Island. Hispaniola (Spanish: La Española; Latin and French: Hispaniola; Haitian Creole: Ispayola; Taino: Haiti) is an island in the Caribbean island group known as the Greater Antilles. It is the second largest island in the Caribbean after Cuba, and the most populous island in the Caribbean; it is also the eleventh most populous island in the world. The 76,192-square-kilometre (29,418 sq mi) island is divided between two separate, sovereign nations: the Spanish-speaking Dominican Republic (48,445 km2, 18,705 sq mi) to the east, and French / French Creole-speaking Haiti (27,750 km2, 10,710 sq mi) to the west. The only other shared island in the Caribbean is Saint Martin, which is shared between France (Saint-Martin) and the Netherlands (Sint Maarten). Due to Taíno, Spanish and French influences on the island, historically the whole island was often referred to as Haiti, Hayti, Santo Domingo, St. Domingue, or San Domingo. The colonial terms Saint-Domingue and Santo Domingo are sometimes still applied to the whole island, though these names refer, respectively, to the colonies that became Haiti and the Dominican Republic. Since Anghiera's literary work was translated into English and French soon after being written, the name Hispaniola became the most frequently used term in English-speaking countries for the island in scientific and cartographic works. In 1918, the United States occupation government, led by Harry Shepard Knapp, obliged the use of the name Hispaniola on the island, and recommended the use of that name to the National Geographic Society. The name Haïti was adopted by Haitian revolutionary Jean-Jacques Dessalines in 1804, as the official name of independent Saint-Domingue, as a tribute to the Amerindian predecessors. It was also adopted as the official name of independent Santo Domingo, as the Republic of Spanish Haiti, a state that existed from November 1821 until its annexation by Haiti in February 1822. The primary indigenous group on the island of Hispaniola was the Arawak/Taíno people. The Arawak tribe originated in the Orinoco Delta, spreading from Venezuela. They travelled to Hispaniola around 1200 CE. Each society on the island was a small independent kingdom with a lead known as a cacique. In 1492, which is considered the peak of the Taíno, there were five different kingdoms on the island, the Xaragua, Higuey (Caizcimu), Magua (Huhabo), Ciguayos (Cayabo or Maguana), and Marien (Bainoa). Many distinct Taíno languages also existed in this time period. There is still heated debate over the population of Taíno people on the island of Hispaniola in 1492, but estimates range upwards of 750,000. The Arawak/Taíno people travelled often and used hollowed canoes with paddles when on the water for fishing or for migration purposes, and upwards of 100 people could fit into a single canoe. The Taíno came in contact with the Caribs, another indigenous tribe, often. The caribs lived mostly in modern day Puerto Rico and northeast Hispaniola and were known to be hostile towards other tribes. The Arawak/Taíno people had to defend themselves using bow and arrows with poisoned tips and some war clubs. When Columbus landed on Hispaniola, many Taíno leaders wanted protection from the Caribs. Christopher Columbus inadvertently landed on the island during his first voyage across the Atlantic in 1492, where his flagship, the Santa Maria, sank after running aground on December 25. A contingent of men were left at an outpost christened La Navidad, on the north coast of present-day Puerto Plata. On his return the following year, Columbus quickly established a second compound farther east in present-day Dominican Republic, La Isabela after the destruction of La Navidad. The island was inhabited by the Taíno, one of the indigenous Arawak peoples. The Taíno helped Columbus construct La Navidad on what is now Môle-Saint-Nicolas, Haiti, in December 1492. European colonization of the island began in earnest the following year, when 1,300 men arrived from Spain under the watch of Bartolomeo Columbus. In 1496, the town of Nueva Isabela was founded. After being destroyed by a hurricane, it was rebuilt on the opposite side of the Ozama River and called Santo Domingo. It is the oldest permanent European settlement in the Americas. Harsh enslavement by Spanish colonists, as well as redirection of food supplies and labor, had a devastating impact on both mortality and fertility of the Taíno population over the first quarter century. Colonial administrators and Dominican and Hyeronimite priests observed that the search for gold and agrarian enslavement through the encomienda system were depressing population. Demographic data from two provinces in 1514 shows a low birth rate consistent with a 3.5% annual population decline. 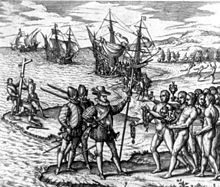 In 1503 the colony began to import African slaves after a charter was passed in 1501 allowing the import of slaves by Ferdinand and Isabel. The Spanish believed Africans would be more capable of performing physical labor. From 1519 to 1533, the indigenous uprising known as Enriquillo's Revolt, after the Taíno cacique who lead them, ensued, resulting from escaped African slaves on the island possibly working with the Taíno people. Precious metals played a large role in the history of the island after Columbus's arrival. One of the first inhabitants Columbus came across on this island was "a girl wearing only a gold nose plug". Soon the Taínos were trading pieces of gold for hawk's bells with their cacique declaring the gold came from Cibao. Traveling further east from Navidad, Columbus came across the Yaque del Norte River, which he named Rio de Oro because its "sands abound in gold dust". Under Nicolás de Ovando y Cáceres' governorship, the Indians were made to work in the gold mines. By 1503, the Spanish Crown legalized the distribution of Indians to work the mines as part of the encomienda system. Once the Indians entered the mines, they were often wiped out by hunger and difficult conditions. By 1508, the Taíno population of about 400,000 was reduced to 60,000, and by 1514, only 26,334 remained. About half resided in the mining towns of Concepcion, Santiago, Santo Domingo, and Buenaventura. The repartimiento of 1514 accelerated emigration of the Spanish colonists, coupled with the exhaustion of the mines. :191–192 The first documented outbreak of smallpox, previously an Eastern hemisphere disease, occurred on Hispaniola in December 1518 among enslaved African miners. Some scholars speculate that European diseases arrived before this date, but there is no compelling evidence for an outbreak. The natives had no immunity to European diseases, including smallpox. By May 1519, as many as one-third of the remaining Taínos had died. Christopher Columbus brought sugar cane on his second voyage to the island. Molasses was the chief product. Diego Colon's plantation had 40 African slaves in 1522. By 1526, 19 mills were in operation from Azua to Santo Domingo. :224 In 1574, a census taken of the Greater Antilles reported 1,000 Spaniards and 12,000 African slaves on Hispaniola. In 1665, French colonization of the island was officially recognized by King Louis XIV. The French colony was given the name Saint-Domingue. 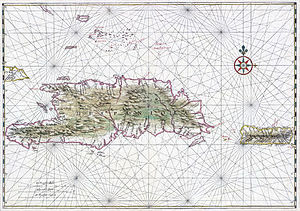 In the 1697 Treaty of Ryswick, Spain formally ceded the western third of the island to France. Saint-Domingue quickly came to overshadow the east in both wealth and population. Nicknamed the "Pearl of the Antilles", it became the richest and most prosperous colony in the West Indies, with a system of human enslavement used to grow and harvest sugar cane during a time when sugar demand was high in Europe. Slavery kept prices low and profit was maximized. It was an important port in the Americas for goods and products flowing to and from France and Europe. European colonists often died young due to tropical fevers, as well as from violent slave resistance in the late eighteenth century. In 1791, during the French Revolution, a major slave revolt broke out on Saint-Domingue. When the French Republic abolished slavery in the colonies on February 4, 1794, it was a European first. The ex-slave army joined forces with France in its war against its European neighbors. In the second 1795 Treaty of Basel (July 22), Spain ceded the eastern two-thirds of the island of Hispaniola, later to become the Dominican Republic. French settlers had begun to colonize some areas in the Spanish side of the territory. Under Napoleon, France reimposed slavery in most of its Caribbean islands in 1802 and sent an army to bring Saint-Domingue under tighter control. However, thousands of the French troops succumbed to yellow fever during the summer months, and more than half of the French army died because of disease. After the French removed the surviving 7,000 troops in late 1803, the leaders of the revolution declared western Hispaniola the new nation of independent Haiti in early 1804. France continued to rule Spanish Santo Domingo. In 1805, Haitian troops of General Henri Christophe tried to conquer all of Hispaniola. They invaded Santo Domingo and sacked the towns of Santiago de los Caballeros and Moca, killing most of their residents, but news of a French fleet sailing towards Haiti forced General Christophe to withdraw from the east, leaving it in French hands. In 1808, following Napoleon's invasion of Spain, the criollos of Santo Domingo revolted against French rule and, with the aid of the United Kingdom, returned Santo Domingo to Spanish control. Fearing the influence of a society that had successfully fought and won against their enslavers, the United States and European powers refused to recognize Haiti, the second republic in the Western Hemisphere. France demanded a high payment for compensation to slaveholders who lost their property, and Haiti was saddled with unmanageable debt for decades. It became one of the poorest countries in the Americas, while the Dominican Republic  gradually has developed into the one of the largest economies of Central America and the Caribbean. Hispaniola is the second-largest island in the Caribbean (after Cuba), with an area of 76,192 square kilometers (29,418 sq mi), 48,440 square kilometers (18,700 sq mi) of which is under the sovereignty of the Dominican Republic occupying the eastern portion and 27,750 square kilometers (10,710 sq mi) under the sovereignty of Haiti occupying the western portion. The island of Cuba lies 80 kilometers (50 mi) to the northwest across the Windward Passage; 190 km to the southwest lies Jamaica, separated by the Jamaica Channel. Puerto Rico lies 130 km east of Hispaniola across the Mona Passage. The Bahamas and Turks and Caicos Islands lie to the north. Its westernmost point is known as Cap Carcasse. Cuba, Hispaniola, Jamaica, and Puerto Rico are collectively known as the Greater Antilles. The island has five major ranges of mountains: The Central Range, known as the Dominican Republic as the Cordillera Central, spans the central part of the island, extending from the south coast of the Dominican Republic into northwestern Haiti, where it is known as the Massif du Nord. This mountain range boasts the highest peak in the Antilles, Pico Duarte at 3,098 meters (10,164 ft) above sea level. The Cordillera Septentrional runs parallel to the Central Range across the northern end of the Dominican Republic, extending into the Atlantic Ocean as the Samaná Peninsula. The Cordillera Central and Cordillera Septentrional are separated by the lowlands of the Cibao Valley and the Atlantic coastal plains, which extend westward into Haiti as the Plaine du Nord (Northern Plain). The lowest of the ranges is the Cordillera Oriental, in the eastern part of the country. The southern range begins in the southwestern most Dominican Republic as the Sierra de Bahoruco, and extends west into Haiti as the Massif de la Selle and the Massif de la Hotte, which form the mountainous spine of Haiti’s southern peninsula. Pic de la Selle is the highest peak in the southern range, the third highest peak in the Antilles and consequently the highest point in Haiti, at 2,680 meters (8,790 ft) above sea level. A depression runs parallel to the southern range, between the southern range and the Chaîne des Matheux-Sierra de Neiba. It is known as the Plaine du Cul-de-Sac in Haiti, and Haiti’s capital Port-au-Prince lies at its western end. The depression is home to a chain of salt lakes, including Lake Azuei in Haiti and Lake Enriquillo in the Dominican Republic. The island has four distinct ecoregions. The Hispaniolan moist forests ecoregion covers approximately 50% of the island, especially the northern and eastern portions, predominantly in the lowlands but extending up to 2,100 meters (6,900 ft) elevation. The Hispaniolan dry forests ecoregion occupies approximately 20% of the island, lying in the rain shadow of the mountains in the southern and western portion of the island and in the Cibao valley in the center-north of the island. The Hispaniolan pine forests occupy the mountainous 15% of the island, above 850 metres (2,790 ft) elevation. The flooded grasslands and savannas ecoregion in the south central region of the island surrounds a chain of lakes and lagoons in which the most notable include that of Lake Azuei and Trou Caïman in Haiti and the nearby Lake Enriquillo in the Dominican Republic. There are many bird species in Hispaniola, and the island's amphibian species are also diverse. Numerous land species on the island are endangered and could become extinct. There are many species endemic to the island including insects and other invertebrates, reptiles, and mammals. The most famous endemic mammal on the island is the Hispaniola Hutia (Plagiodontia aedium). There are also many avian species on the island. The six endemic genera are Calyptophilus, Dulus, Nesoctites, Phaenicophilus, Xenoligea and Microligea. More than half of the original ecoregion has been lost to habitat destruction impacting the local fauna. In Haiti, deforestation has long been cited by scientists as a source of ecological crisis; the timber industry dates back to French colonial rule. Haiti has seen a dramatic reduction of forests due to the excessive and increasing use of charcoal as fuel for cooking. Various media outlets have suggested that the country has just 2% forest cover, but this has not been substantiated by research. Recent in-depth studies of satellite imagery and environmental analysis regarding forest classification conclude that Haiti actually has approximately 30% tree cover; this is, nevertheless, a stark decrease from the country's 60% forest cover in 1925. The country has been significantly deforested over the last 50 years, resulting in the desertification of portions of the Haitian territory. In the Dominican Republic, the forest cover has increased. In 2003, the Dominican forest cover had been reduced to 32% of the territory, but by 2011, forest cover had increased to nearly 40%. The success of the Dominican forest growth is due to several Dominican government policies and private organizations for the purpose, and a strong educational campaign that has resulted in increased awareness on the Dominican people of the importance of forests for their welfare and in other forms of life on the island. Except in the Northern Hemisphere summer season, the predominant winds over Hispaniola are the northeast trade winds. As in Jamaica and Cuba, these winds deposit their moisture on the northern mountains, and create a distinct rain shadow on the southern coast, where some areas receive as little as 400 millimetres (16 in) of rainfall, and have semi-arid climates. Annual rainfall under 600 millimetres (24 in) also occurs on the southern coast of Haiti’s northwest peninsula and in the central Azúa region of the Plaine du Cul-de-Sac. In these regions, moreover, there is generally little rainfall outside hurricane season from August to October, and droughts are by no means uncommon when hurricanes do not come. On the northern coast, in contrast, rainfall may peak between December and February, though some rain falls in all months of the year. Annual amounts typically range from 1,700 to 2,000 millimetres (67 to 79 in) on the northern coastal lowlands; there is probably much more in the Cordillera Septentrional, though no data exist. The interior of Hispaniola, along with the southeastern coast centered around Santo Domingo, typically receives around 1,400 millimetres (55 in) per year, with a distinct wet season from May to October. Usually, this wet season has two peaks: one around May, the other around the hurricane season. In the interior highlands, rainfall is much greater, around 3,100 millimetres (120 in) per year, but with a similar pattern to that observed in the central lowlands. As is usual for tropical islands, variations of temperature are much less marked than rainfall variations, and depend only on altitude. Lowland Hispaniola is generally oppressively hot and humid, with temperatures averaging 28 °C (82 °F). with high humidity during the daytime, and around 20 °C (68 °F) at night. At higher altitudes, temperatures fall steadily, so that frosts occur during the dry season on the highest peaks, where maxima are no higher than 18 °C (64 °F). Hispaniola is the most populous Caribbean island with combined population of almost 22 million inhabitants as of April 2019. The ethnic composition of Haiti is estimated to be 95% black and 5% white and mulatto. In recent times, Dominican and Puerto Rican researchers identified in the current Dominican population the presence of genes belonging to the aborigines of the Canary Islands (commonly called Guanches). These types of genes also have been detected in Puerto Rico. The island also has an economic history and current day interest and involvement in precious metals. In 1860, it was observed that the island contained a large supply of gold, of which the early Spaniards had hardly developed. By 1919, Condit and Ross noted that much of the island was covered by government granted concessions for mining different types of minerals. Besides gold, these minerals included silver, manganese, copper, magnetite, iron and nickel. ^ a b c Anglería, Pedro Mártir de (1949). Décadas del Nuevo Mundo, Tercera Década, Libro VII (in Spanish). Buenos Aires: Editorial Bajel. ^ a b Las Casas, Fray Bartolomé de (1966). Apologética Histórica Sumaria (in Spanish). Mexico: UNAM. ^ "Embassy of the Dominican Republic, in the United States". Archived from the original on May 24, 2007. Retrieved February 27, 2009. ^ a b "Haiti". The World Factbook. Central Intelligence Agency. ^ a b McIntosh, Gregory C (2000). The Piri Reis Map of 1513. University of Georgia Press. p. 88. ISBN 978-0-8203-2157-8. ^ Schwartz, Albert (1989). "The Butterflies of Hispaniola". p. 10. ISBN 978-0-8130-0902-5. Retrieved April 12, 2015. ^ Castillo Pantaleón, Juan Miguel (2012). La Nacionalidad Dominicana (in Spanish). Santo Domingo: Editora Nacional, Ministerio de Cultura. p. 329. ISBN 978-9945-469-97-4. Retrieved June 15, 2015. ^ Lancer, Jalisco. "The Conflict Between Haiti and the Dominican Republic". www.allempires.com. Retrieved November 13, 2018. ^ "Haiti – Historical Flags". Flags of the World. Archived from the original on May 5, 2005. Retrieved December 24, 2007. ^ a b c d e Poole, Robert (2011). "What Became of the Taíno?". Smithsonian. 70 – via ProQuest. ^ a b c Cook, Noble David (2005). "Taino (Arawak) Indians". Encyclopedia of Genocide and Crimes Against Humanity. 3 – via GVRL. ^ a b c d e f g h i j k l m n o Corbett, Bob (1995). "The History of Haiti". Retrieved November 20, 2018. ^ Berman, Mary (2008). "The Greater Antilles and Bahamas". Encyclopedia of Archaeology – via Credo. ^ Holguín (2010). 21st Century Anthropology: A Reference Handbook. Thousand Oaks, CA, USA: Sage Publications. ISBN - 9781412957380. ^ "What Are Some Facts About Christopher Columbus?". ^ Centre, UNESCO World Heritage. "Colonial City of Santo Domingo". whc.unesco.org. Retrieved October 4, 2018. ^ a b c d Livi-Bacci, Massimo (2006). "The Depopulation of Hispanic America after the Conquest". Population and Development Review. 32 (2): 208–213. doi:10.1111/j.1728-4457.2006.00116.x. ISSN 0098-7921. JSTOR 20058872. ^ "The Early Trans-Atlantic Slave Trade: Nicolas Ovando · African Laborers for a New Empire: Iberia, Slavery, and the Atlantic World · Lowcountry Digital History Initiative". ldhi.library.cofc.edu. Retrieved October 4, 2018. ^ a b c Columbus, Ferdinand (1959). The Life of the Admiral Christopher Columbus by his son Ferdinand. New Brunswick: Rutgers, The State University. pp. 76–77, 83, 87. ^ Pons, Frank (1995). The Dominican Republic, A National History. New Rochelle: Hispaniola Books. pp. 33–37. ISBN 1885509014. ^ a b Hopkins, Donald R. (September 15, 2002). The Greatest Killer: Smallpox in History. University of Chicago Press. p. 205. ISBN 978-0-226-35168-1. ^ Austin Alchon, Suzanne (2003). A pest in the land: new world epidemics in a global perspective. University of New Mexico Press. p. 62. ISBN 0-8263-2871-7. ^ Morison, Samuel Eliot (1972). The Oxford History of the American People. New York City: Mentor. p. 71. ISBN 0-451-62600-1. ^ "Hispaniola Article". Britannica.com. Retrieved January 4, 2014. ^ "Dominican Republic 2014". Retrieved April 24, 2014. ^ a b c Bowin, Carl (1975). Nairn, Alan; Stehli, Francis (eds.). The Geology of Hispaniola, in The Ocean Basins and Margins. New York: Springer Science+Business Media, LLC. p. 503. ISBN 9781468485370. ^ "Caribbean: Island of Hispaniola | Ecoregions | WWF". World Wildlife Fund. Retrieved December 6, 2018. ^ "The island of Hispaniola in the Caribbean | Ecoregions | WWF". World Wildlife Fund. Retrieved October 4, 2018. ^ O'Connor, M. R., ed. (October 13, 2016). "One of the Most Repeated Facts about Haiti is a Lie". Vice News. ^ "Haiti is Covered with Trees". EnviroSociety. Tarter, Andrew. Retrieved May 19, 2016. ^ "República Dominicana aumenta su cobertura boscosa a 39.7% - Fundación Global Democracia y Desarrollo". ^ a b Alpert, Leo (1941). "The Areal Distribution of Mean Annual Rainfall Over the Island of Hispaniola". Monthly Weather Review. 69 (7): 201. doi:10.1175/1520-0493(1941)069<0201:TADOMA>2.0.CO;2. ^ Camberlin, Pierre (2010). "More variable tropical climates have a slower demographic growth" (PDF). Climate Research. 41: 157. doi:10.3354/cr00856. ^ "Haitians Heroes" (PDF). Palmbeachschools.org. Archived from the original (PDF) on October 21, 2013. ^ "DOMINICAN REPUBLIC". Encyclopedia of the Nations. ^ Bello, Marisol (January 21, 2010). "Hispaniola comparison". USA Today. Retrieved October 9, 2016. ^ Gibson, Carrie (October 7, 2013). "The Dominican Republic and Haiti: one island riven by an unresolved past | Carrie Gibson". the Guardian. Retrieved November 13, 2018. ^ Courtney, W.S. (1860). The Gold Fields of St. Domingo. New York: Anson P. Norton. pp. 123–125. ^ Condit, D. Dale; Ross, Clyde P. (1921). Economic Geology, Chapter X, in A Geological Reconnaissance of the Dominican Republic. Washington: United States Geological Survey. p. 228. ^ "Pueblo Viejo Gold Mine, Dominican Republic". mining-technology.com. Retrieved December 28, 2016. ^ "Cerro de Maimon". Perilya.com. Retrieved December 28, 2016.